The Artist’s Way was a book published in 1992 by Julia Cameron. It became a runaway best-seller, selling over four million copies. The Artist’s Way is basically a twelve-week program that aimed to help artists, both professional artists and hobbyists, to remove blocks that were preventing them from producing their art, whether it be writer’s block, a lack of confidence, a lack of inspiration, or other common emotions that artists face like fear, low self-worth, and lack of confidence. One of the things that made the book so popular was how simple and practical it was. She provided practical exercises such as “Morning Pages” (basically keeping a daily journal on any subject), and “Artist’s Dates” (consciously blocking out time to do nothing but observe and experience what’s around them). While these sound simplistic, it’s amazing how the simplest things can sometimes help remove the toughest blocks. And as someone who does believe in God, I really appreciate how she doesn’t shy away from encouraging us to tap into Him as the ultimate creative force–and she does it without being preachy nor even espousing any particular religion. Cameron mentions in her book that over the years, parents have approached her asking if she could write a book to help children discover their creativity. She’s finally done that with The Artist’s Way for Parents: Raising Creative Children . 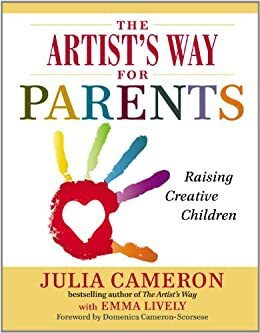 Perhaps inspired by the birth of her granddaughter (fittingly, the forward of the book is written by Domenica Cameron-Scorsese, her daughter), this book is a great book for parents and soon-to-be-parents on how to help encourage creativity in kids from birth to twelve years ago. I admit, I was a little skeptical when I heard this was a book on how to “encourage creativity in kids”–after all, kids should be the ones instructing us adults on how to remember what it was like when we were young and had boundless creativity and imagination. But in many ways, this book is needed more than ever. We seem to live in a world where art and creativity are increasingly marginalized. It’s not an uncommon site to see kids with their faces planted into tablets and smartphones and portable video game consoles instead of out there using their imaginations. And even old fashioned “analog” toys have become so intricate and so detailed that very little is left to kids’ imaginations anymore. And worse, society itself doesn’t seem to foster creativity as it used to. Arts program in school seem to always be the first things cut when budgets get tight, sometimes in underprivileged schools where the ability to dream and pull oneself out of hopelessness is needed more than ever. And even in more affluent places, kids grow up with the same unfortunate conditioning that adults are: that it’s more important to make money and to always be busy doing the next thing rather than take time to develop the inner creativity that’s within all of us. Each chapter of the book is dedicated to cultivating an aspect of life that’s needed for creativity to flourish, from safety, to curiosity, to focus, to humility. Each chapter is filled with personal anecdotes from Cameron’s own life and her own experience as a parent, as well as quotes and advice from other leading authors. I think as with the original Artist’s Way, how you approach the book will greatly affect how much you get out of it. I don’t think the book is meant to be read as a “parenting guide” that you follow like a literal 12-step program that’s supposed to teach you everything that’s right and wrong to do with your kids. Rather, I see it more as written as “advice from a friend”, where you can read over what parts are useful to you and your kids. The book is extremely practical. One part of the book addresses the age-old statement that all kids eventually blurt to their parent, “I’m bored”, and gives practice advice on how to deal with it. In the chapter about limits, it talks about another universal problem: clutter. The chapter on self-expression talks about the importance of letting our kids explore their own creative directions, and how to watch ourselves that we don’t inject too much of ourselves and our own interests. These are just three random parts of the book that I flipped to, but the rest of the book is filled with extremely useful things that, even if they don’t necessarily present a complete solution, they remind us to think about these things and how addressing them can open the way for our children, and us, to be more creative. As with the original Artist’s Way, this book contains a lot of exercises that parents can do, and in some cases that parents can do together with their kids. The chapter on “Cultivating Conscious Inflow”, which on the surface sounds kind of new-agey, actually provides very down-to-earth advice on encouraging things like music, reading, and storytelling with our kids. The activity at the end of the chapter suggests that you tell a story to your child about any subject, and then immediately have them tell you a story back and really listen to what she’s saying. The chapter on “Cultivating Limits” introduces us to an activity called “The Seventy-Two Pickup”, where whenever a mess got out of hand, Cameron’s mother would make a game out of clean-up, counting out seventy-two seconds for her kids to put away as many toys as they could in that time. From my early reading of the book, I predict this book is going to be another runaway best seller for Cameron. I agree with the author’s contention that every child is creative and every parent is creative. This book won’t necessarily make your child the next Rembrandt or Beethoven, but using the practical advice and tools inside, I think most parents who use it will be surprised at how much creativity is locked inside both themselves and their kids, waiting to come out. The book is set to be released on August 15. For every copy that’s sold before August 15, the publisher Tarcher/Penguin will donate $1 to the LilySarahGraceFund, an amazing charity out of Stamford, Connecticut that helps bring art to underprivileged and underfunded schools throughout the United States, and to the International Child Art Foundation, which has a goal of reducing suffering and violence for kids internationally through the arts.